Re: Secret Santa 2018 - Part 5. DONE! Not because I'm a mean guy But as a pal collector Finding usa games is not that common since for many consoles there is a region lock, some stuff is imported but in general not that common for allot of consoles it is pretty special. Seeing someone complain about receiving pal games as an usa collector wich is ofcourse understandable. If overseas buyers where still to participate in the future I would recommend them hunting for ds gba or gameboy stuff since those are the only consoles in wich case there is a decent amount of usa stuff out there since it isn't region locked from back in the day if one where to request some non exclusives. USA ps4 switch games are most definitely there but you would need to get them from specific sources or only buy ntc exclusive games wich where not released in europe but available in european stores. ofcourse there is also the option for pal exclusives for certain consoles but that could be tough to get depending on the item. eitherway it is a bit more difficult to mix different countries. Also in terms of overseas participants I would recommend to request usa exclusive items since I'm pretty sure pal stuff is also pretty hard to get in the usa maybe even more so in the handheld department compared to europe. High shipping costs and slow shipping times could also be a side issue as far as this goes but I have seen some dissapointed faces over the years from USA santa's receiving gifts from pal senders in these topics so here are my two cents. If overseas buyers where still to participate in the future I would recommend them hunting for ds gba or gameboy stuff since those are the only consoles in wich case there is a decent amount of usa stuff out there since it isn't region locked from back in the day if one where to request some non exclusives. Turf was my Secret Santa this year and I got a whole goodie bag of GBA games here! Th bottom 5 [Banjo-Kazooie: Grunty's Revenge, Rayman Advance, Super Puzzle Fighter II, ChuChu Rocket, Magical Drop] were all on my list. ChuChu Rocket was being a little finicky at first but those 5 work. 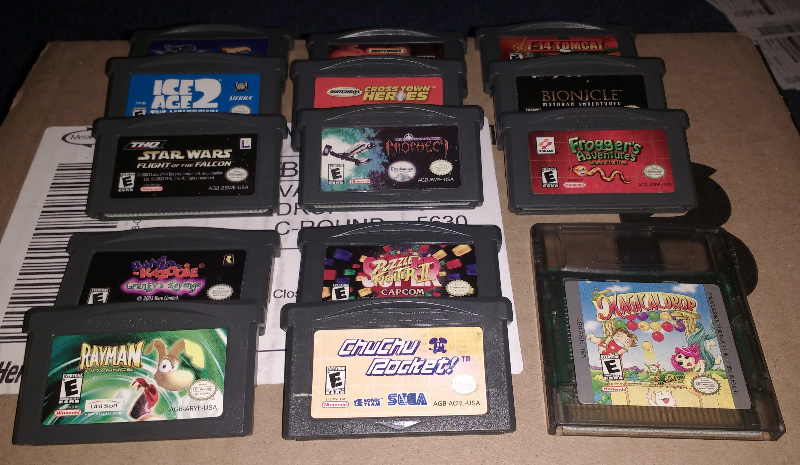 I also got a handful of other GBA games (Frogger's Adventures being the only dupe of the lot). The Game Boy Advance was the first Nintendo console I've owned so I'm still happy to wittle away the hours on a bunch of these games for years to come. Thank you very much Turf and hope you all had a great Christmas this year. EDIT: Polarium Advance was missing from the photo because it was still in my DS, as soon as I saw the 'ATLUS' logo I knew this was going to be good. Shaping up to be a nice little addition to my collection. Thanks again. Note that I always state the condition, version & region I want on my SS wishlist. As an overseas participant, personally think this is the best method for all parties. I do agree allot of pal games in general are more expensive than the ntc counter parts but the USa has some extreme super high end 1K + examples wich are less plentifull in pal regions. and yes if one where to request for example for ps1 ps2 consoles and let's say a wild arms 2 ps1 wich is an ntc exclusive I mean in pal regions these go for premiums allot higher than in the US the price differences can get pretty big. I will say that it is an pretty nice idea if overseas buyers would buy in the USA and ship it directly to the person living in the US avoiding all the flaws as I mentioned but I could potentially see a problem that not all sellers in the US would accept payments from overseas buyers so in some cases there should be some help from a usa member if it doesn't work out. Just to throw this out there, I wasn't really complaining and figured the drop shipping was because my SS was international. I second the notion that we shouldn't assume that our SS will always be based in the US That's why I've always picked out a bunch of region free stuff so that the games will work. (GB / GBA / DS / PS3). I always see photographs of people with dozens of games from their secret santa. It makes me feel like i'm being stingy, but oh wait I went over-budget, again! I usually draw something for these kinds of gifts too. The recipient didn't share their loot in the forum threads so it felt unappreciated, even when I tried to build up the sentimental value in my own personal way. Also thanks for the feedback, I was gonna include some digital art myself but seeing as you were 'disappointed' I'm relieved I decided against it. I don't I'll bother participating next year. The comment "Half-assed" I think is what hurt the most. The hours I spent digging through online listings finding the couple items I could even consider for the SS considering the budget we had. like I didn't bloody try or something. Gonna lock this. I feel that any more responses on this thread are going to be bringing it even more into a place where it really shouldnt go. Im pretty upset that it got to this point. Ive seen people receive gifts that they were not happy with (I know of one person who received 1 game valued around $8 that they already had in their collection for years and that was the entire package). I myself have received gifts that didnt quite fit my wishlist (One was a single homebrew for a system I dont collect for or even own). The fact is no one has complained publicly till now. The focus was to give a gift to someone else online. I hate to say it but this has been the toughest Secret Santa to sit through cause of this. I will probably not continue this tradition on here after this year.